The Zuni Reservation, also referred to as the Zuni Pueblo, is located about 150 miles west of Albuquerque. The main reservation is located in the western part of New Mexico, but the Zuni also have holdings in Apache County, Arizona, which are not adjacent to the main reservation. According to Zuni traditional knowledge, the Zuni finally arrived at the Middle Place, or Ha'wi-k'uh, after a long migration. Historically, the ancient site of Ha'wi-k'uh was the first pueblo village encountered by Spanish explorers, specifically an African slave named Estavenico. Although Estavenico was killed trying to escape from the Zuni hosts he had ceremonially offended, later reports of this first encounter identified Zuni land as the the site of the fabled cities of gold, which in subsequent generations became known as Cibola. Most historians have assumed that Cibola, and therefore what is now the Zuni Reservation, is a reference to a European myth about the fabled Seven Cities of Gold, but other research suggests that Cibloa may be a Spanish mistranslation of the Zuni self-ascription A:shiwi. 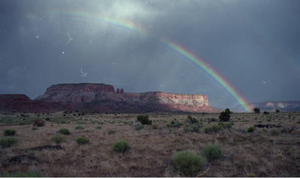 "Rainbow, Zuni Pueblo," photograph, (2000-017-B19-F18-2). Center for Southwest Research, University Libraries, University of New Mexico. American Ethnology. Washington: U. S. Government Printing Office. Land Rights. Lawrence: University Press of Kansas. Monographs. New Haven: Human Relations Area Files.